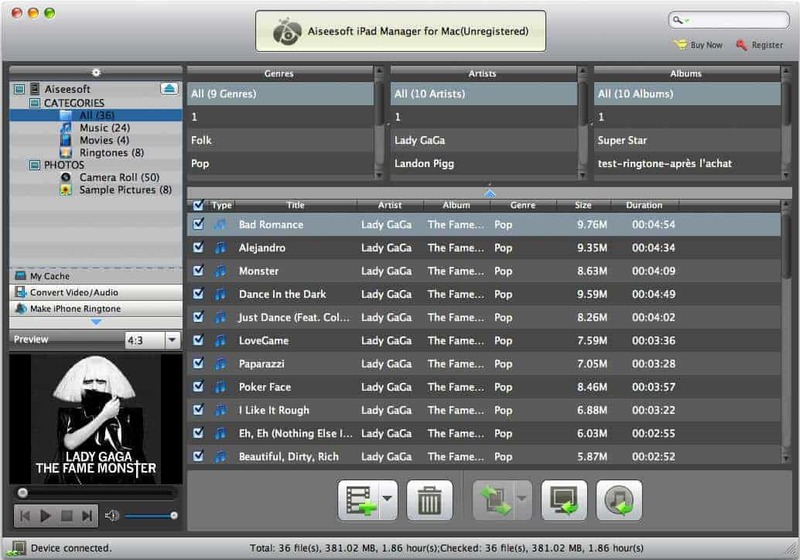 Aiseesoft iPad Manager for Mac can not only export music, movies, camera roll, and pictures on iPad to Mac for backup, but also import local videos, audio files and photos to iPad without any loss. Also it enables you to convert popular videos/audios to iPad compatible formats, then import them to iPad directly, make iPhone M4R Ringtone from your video, audio, recording, MTV album, even import your iPad files to iTunes. Moreover, it highly supports iPhone 5s/5c, iPad mini 2, iPad Air and iPod nano 7,etc. With this software, you can easily transfer music, videos, images and ringtones from Mac to iPad, and backup your iPad music, movies, pictures and Camera Roll to local disk on Mac. You can use this software to back your iPad files to iTunes for fear of any file loss. It is possible for you to transfer iPad files to other iOS devices including iPad, iPhone and iPod. It is easy for you to convert any video and audio file to iPad supported formats, and then export them to iPad directly. iPad files ID3 info, like name, artist, album, track number, lyrics, etc. can be edited by you with no sweat. This iPad Transfer for Mac supports all versions of iPod, iPad and iPhone devices.